The old blog may be a bit quiet for the next few weeks while we work on packing and moving. I packed most of my fabric and quilts and it was a tad embarrassing. It’s easy to ignore all those things packed away in various closets, but harder when they’re all boxed up in front of you! In the midst of it all, I felt I should quickly sandwich and quilt something. This quilt had been waiting for a while, so I pulled it out and and gave it the straight line treatment. These solids are Alissa Haight Carlton’s Modern Solids, made up as half rectangle triangles (though the design could just as easily be made with half square triangles – I just happened to be playing with rectangles at the time!). I had a fat quarter of each color, so you may see here and there where I didn’t have quite enough fabric and had to add in something similar. The backing is pieced with all the leftovers, including a bunch of leftover triangles. It was kind of a fun challenge, as I was down to smaller pieces, with barely enough to get a backing made. Ah, there’s something I really love about quilts out of all solids! Previous post about this quilt can be found here. 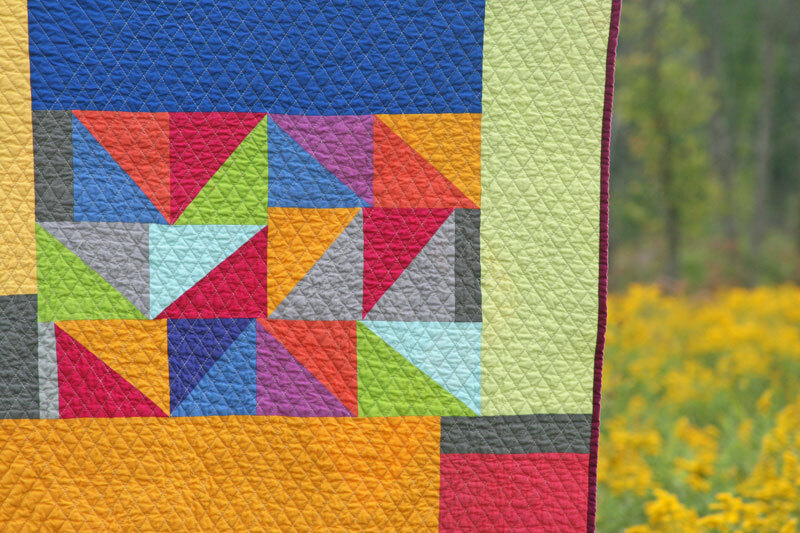 This entry was posted in [search] HST Quilts, Fabric, Finished Quilts, Posts about Quilts, Quilts and tagged alissa haight carlton, baby quilt, half rectangle triangles, handmade, in the beginning, modern solids, quilt, solids. Bookmark the permalink. Is there a pattern for this awesome quilt?? Love everything about it!! A beauty! I think you should call it your Moving Quilt. 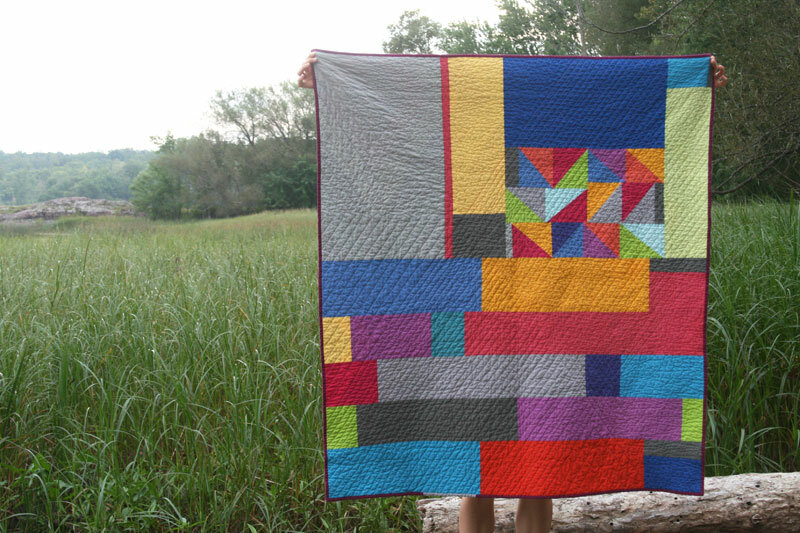 What a fabulous quilt and I love the straight line quilting that you did, really makes it pop! Wow–just lovely. I would like one of these. I think it’s better this way than HST’s. I love how the peaks of similar colors work when you had to stretch to get the colors to work like you want! Love this! Should should write up a pattern for this. gorgeous! quite a statement! Make a pattern! Good luck with moving/packing/unpacking/having an adventure! i love how much thought you put into the back of the quilt! such a lovely touch…now i can’t decide if i like the back or the front better! 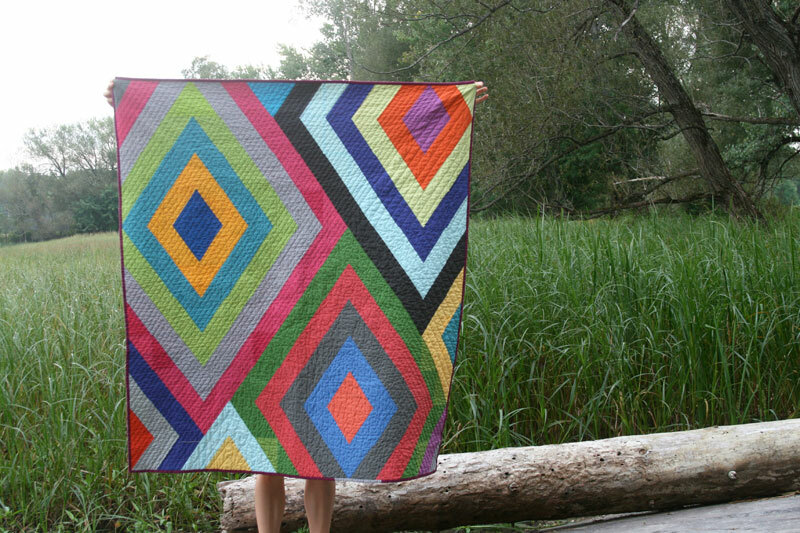 Fabulous quilt….love the colours, love the design, love the cross-hatch quilting and love the back! Beautiful!!!! Best of luck with your move – hope it goes well! Stunning! 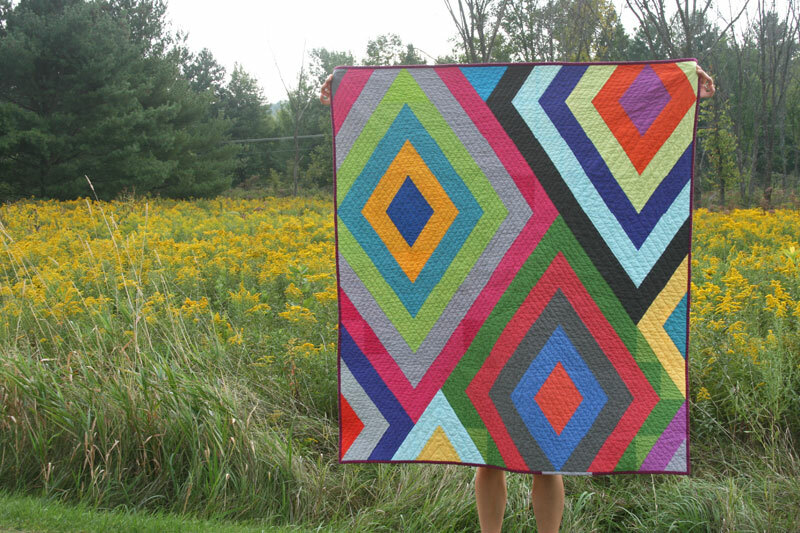 I’d love to try a solids quilt like that. Wow! I just love it. It is stunning. Love the quilt. Good luck with your move. It’s really awesome Ashley! Love the design and quilting! I am a convert to modern quilting. I love this quilt. Please say there are directions somewhere so I may play with color too. Fantastic quilt! I hope you write a pattern for it! And I hope everything goes well with your move. I love the quilt. I would consider it reversible, I love the back. Lovely! I love both the solids and the bold geometric design, and the back is as fabulous as the front. Lovely finish! And I know what you mean about seeing all that sewing stuff out of the closets and cupboards. It’s scary! Love this quilt. What are the names of these solids? Perfect color combo.